Shades of pink fill the advertising space. The TV ads have started, the supermarket have already ‘politely’ reminded us (for the past month) not to FORGET. The high street chains tell us to ‘love your mum’ and ‘give your mum a treat’ and ‘mums the word’. A LUXURIOUS LEATHER HANDBAG will do or a BEAUTIFUL SILK SCARF or a HAND PAINTED POTTERY MUG or a VICTORIAN HIGH TEA WEEKEND or a FUDGE TASTING SUBSCRIPTION or an INDOOR SKYDIVING EXPERIENCE. A gift to celebrate the mother and motherhood and maternal bonds. Mothers day, in the garden, Croydon, March 2014. My Mother, her three daughters and our three daughters, somewhere in between the ground and the sky. Nearly five years earlier I was in the garden in Bristol on Mothers day. It was my due date and I was waiting for my first baby to show me a sign that she was coming. Here we are, all of us, JUMPING. Somewhere between the bending down and the pushing up. This is the best I could find in a series of photographs hoping to capture us all in the air. Considering we are three generations of the same family, we have no inherited, genetic skill that allows us to rise and fall at the same time. We can’t manage any unity. In fact we can’t even hear the count of 1…2…3…GO! because we are laughing and arguing and talking over one another. Instead we resemble the arcade game WHACK-A-MOLE, each popping up and down of its own accord in a clear attempt to irritate. 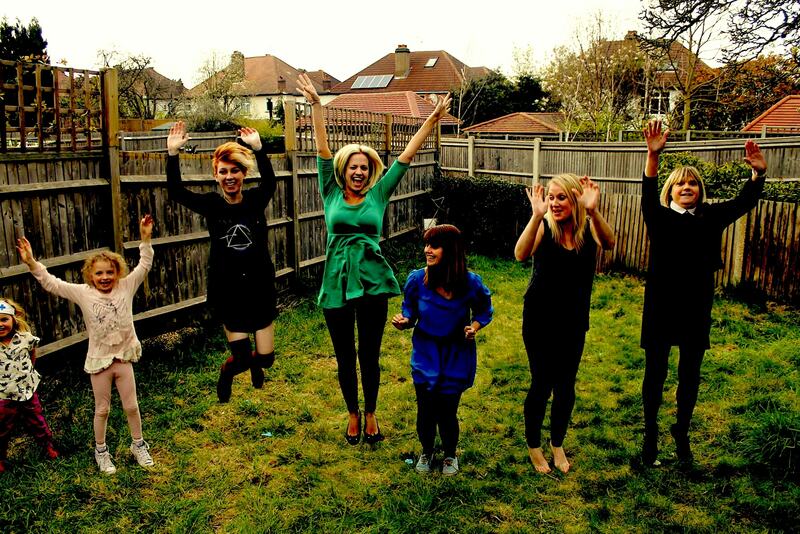 So here we are, all of us attempting to JUMP at the same time. Repeating this action over and over getting worse and worse as we tire and giggle. I asked my four-year-old daughter and six-year-old niece to show us the sort of JUMP that would be best. We copied their moves and listened when they shouted that we weren’t doing it right. So the women in my family keep JUMPING.